For South High School senior Maurice Gilmore, there’s a clear link between the health of our environment and the future of humanity. 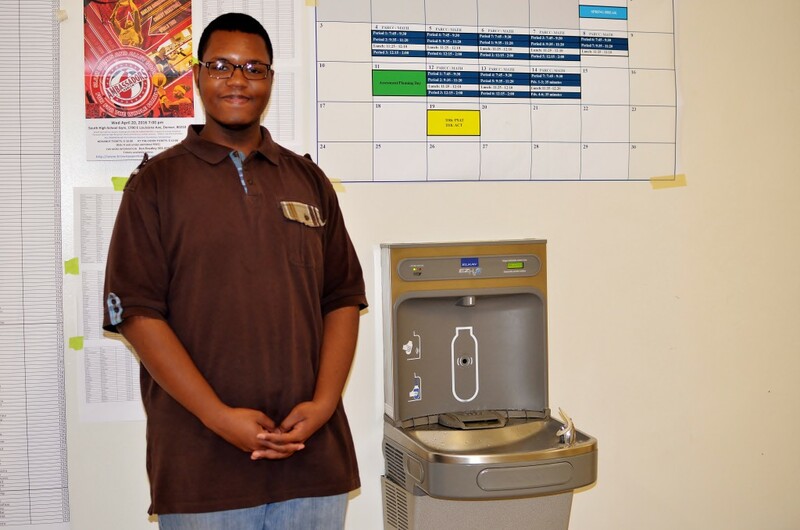 But Souths antiquated water system clouded students commitment to sustainability in several ways.I rarely went to the water fountain,said Maurice. It was warm and didn’t taste too good. Over time, calcium carbonate builds up in water pipes. While the water is safe to drink, the calcium can affect the waters taste, meaning many South students were opting for bottled water. Maurice was dismayed by all of the plastic headed for landfills, as well as another outcome of older water pipes. [Using fewer plastic bottles] is important to me because it keeps the oceans clear, and we don’t have as much trash, said Maurice. There were [also] multiple problems because the water was getting clogged up and we couldn’t do our science experiments. That all changed when Souths entire water system was replaced, as part of extensive renovations funded by the 2012 Denver bond and completed for the 2014-15 school year. Now, water runs freely through new pipes, to both brand-new science labs and water-bottle filling stations. And Maurice is thrilled about how many plastic bottles are no longer landfill-bound. It all adds up to the health of the planet, Maurice said.